"Investigating Vertical Mixing at Eddy A4"
Today we streamed about 50 miles closer to the eddy. Seas were still pretty rough. 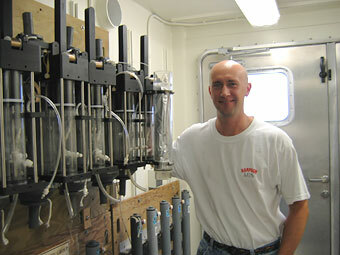 In the morning CTD scans were being completed to obtain water for the Be experiment. The depths that water was taken at remained the same only the location of the sampling was different. We completed that work at 15:00 and then work began on prepping the integrated samplers for the sampling sled. Working with one of the other scientists I have to prime the mechanism with water on in one of the jars and make sure we had a good vacuum on the other side. The sampling of the water will be done using two types of equipment. The first is the array of syringes aptly called the medusa. The syringes are set on a timer to fire off one at a time to take up sea water. The other method of sampling we shall use involves the integrated samplers. They are paced on a cable above and below the sampling sled every 5 meters. These devices are tripped using a weight and once tripped they continually draw in water depending on the time that they are set to work. When we run the sled tomorrow it will be set to sample for 10 hours. At 16:00 we placed the sled in the water and ran a 15 minute test. The actual deployment of the sled took about two hours. So the test was rather trivial. On the good side all equipment worked fine so tomorrow the actual run should run smoothly.